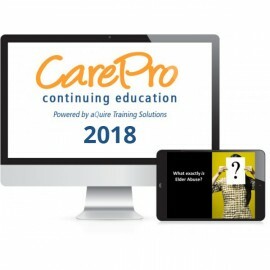 Popular Caregiver online training packages designed for important care topics and state continuing education requirements. The purpose of this course is to familiarize the learner with information on vancomycin-resistant enterococcus (VRE) infections. The course engages the learners in content related to pathophysiology, the infectious process, modes of transmission, and prevention. 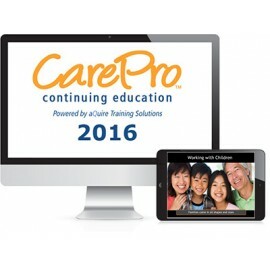 Proper staff education, standard precautions, and isolation precautions are presented. 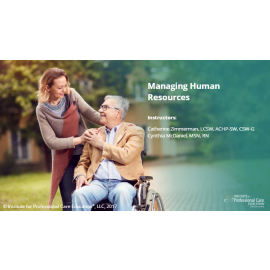 The purpose of this course is to familiarize assisted living and residential care administrators with strategies to be successful at managing human resources. Topics will be presented pertaining to effectively managing human resources in assisted living, as well as important issues an administrator may face in residential care and assisted living settings. Strategies for recruitment and retention, compensation and benefits, and human resource related laws and regulations will be presented. The purpose of this course is to familiarize the learner with psychosocial issues common in later life. Information about the dimensions of health and common life challenges faced by older adults are presented. The course engages learners in learning how to support people in meeting their psychosocial needs through the framework of Maslow’s hierarchy of needs. The purpose of this course is to familiarize the learner with tuberculosis and the screening requirements for those in care settings. The course engages learners in the pathophysiology of the disease, risk factors, screening requirements for residents and staff, diagnosis, and treatment. The role of the public health department and challenges in the treatment of TB are also presented. The purpose of this course is to familiarize the learner with fire safety and emergency preparedness in the community care setting. The course engages learners in learning basic fire safety practices, fire emergency response procedures, equipment use, prevention, and emergency preparedness planning. The purpose of this course is to provide the learner with management skills. Key indicators of employee engagement and strategies to reduce employee turnover are presented. The course offers the learner information and exercises designed to develop good management skills. The purpose of this course is to familiarize the learner with the aging process and its effect on body systems. Information about each body system is presented, including the parts, function, aging changes, and common diseases and conditions related to the system. This course engages the learner in an exploration of the body and care considerations relevant to the aging adult. The purpose of this course is to familiarize the learner with how to provide assistance with self-administration of medications. Information on the types of medications orders, pharmacy label content, forms and routes of medications, and common side effects will be presented. The course engages the learner in the steps for assisting a resident with self-administration of medication, ways to store medications, and the six rights of assisting with medication administration. This purpose of this course is to familiarize the learner with three components of providing person centered care: 1) respecting resident rights, 2) promoting dignity, and encouraging independence. The purpose of this course is to familiarize the learner with how to assist a resident with activities of daily living. Person-centered care concepts provide a framework for delivering care and special considerations for providing assistance to people living with dementia are presented. This course engages the learner in the information and steps to providing assistance with activities of daily living. 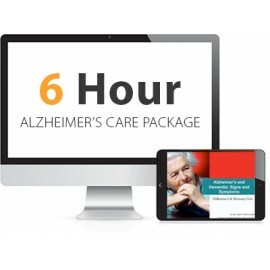 This 6 Hour Alzheimer's Care Package is designed to describe the signs and symptoms of Alzheimer’s disease and how it affects individuals as well as friends and family.